Pesticides have become a major input in the world’s agriculture over the last decades. Usually addressed as insecticides, herbicides, rodenticides, or fungicides according to their overall target species they are mainly deployed to efficiently increase crop production. Furthermore, they are considered beneficial from a public health perspective because by definition they are also used to control vectors of human diseases. However, pesticides comprise a great variety of chemical groups with partly general mechanisms of action. Their detrimental effects are often unspecific and can affect non-target organisms including humans. As early as 1990 a task force of the World Health Organization (WHO) estimated that about one million unintentional pesticides poisonings occur annually leading to approximately 20.000 deaths . Additionally, two million cases were expected to follow from self-harm. It was recognized that low-income countries and countries in transition were particularly affected by the impact of pesticide poisoning and actual numbers are probably much higher as many cases remain unreported . Since then no update of overall pesticide poisoning figures has been achieved due to a lack of country specific data [2,3]. However, the magnitude of self-poisoning by pesticides induced ongoing attention in science and policy. A recent systematic review published in 2007 summarized that self-poisoning by pesticides accounts for 30 % of all suicides. Annually about 260.000 (best case) and 370.000 (realistic cases) deaths were estimated to occur from pesticide poisoning worldwide mostly in rural agricultural areas in low- and middle-income countries [4,5]. During the last decades international bodies have taken up the issue and adopted a great number of resolutions and programs to improve the safe use of pesticides . Realizing, however, that despite all efforts there might be no safe use of toxic pesticides – especially under conditions of poverty – the international Code of Conduct on Pesticide Management of WHO and the Food and Agriculture Organization (FAO) meanwhile endorses a new policy approach by considering the prohibition of highly hazardous pesticides . Pesticides are considered highly hazardous when presenting high acute toxicity according to internationally accepted classification systems such as the WHO Recommended Classification of Pesticides by Hazard  or the Globally Harmonized System of Classification and Labelling of Chemicals – GHS . In addition, pesticides that cause severe or irreversible harm to health “… under conditions of use in a country” may be considered as highly hazardous . The WHO Recommended Classification of Pesticides by Hazard  is in widespread use for hazard identification and risk management. This classification is based primarily on estimates of the acute oral and dermal toxicity to rats. This standard procedure in regulatory toxicology applies also to the GHS. Based on its acute toxicity on rats a pesticide is assigned to five toxicity classes. It is assumed that these hazard classes capture also the acute toxicity for humans. However, an assignment to a higher or lower class is possible if the active ingredient is proved to be more or less toxic in humans . Unfortunately, studies have reported poor agreement between the acute human toxicity of pesticides and the respective WHO hazard classes [10-12]. For example Rao and colleagues highlight the insecticide endosulfan which is classified as”moderately hazardous” according to the WHO, but intoxication is “practically untreatable in humans and associated with high mortality” . Dawson and colleagues conclude from their study in Sri Lanka that acute human toxicity data should be utilized for hazard classification of pesticides as deliberate poisonings prevail . Case fatality and severity scores might be a more realistic indicator for human toxicity of substances than hazard classes based on animal testing. If so, the case fatality should primarily depend on the substance specific toxic properties and not on the characteristics of the incident and treatment e.g. cause, dose, time lag between exposition and treatment. A low variability of the pesticide specific case-fatality-rate (CFR) would then indicate problematic chemicals from a public health perspective as human toxicity of an agent in general was captured rather than the clinical course of a specific poisoning. In emergency medicine several scores and classification systems have been introduced to predict the fatality of a disease and allow for risk stratification . The International Program on Chemical Safety in cooperation with the European Community and the European Association of Poisons Centers and Clinical Toxicologists have introduced and encouraged the use of the Poison Severity Score (PSS) for the prognostic assessment of poisonings and the selection of treatment . Case-fatality is used as an end-stage category in the PSS and other severity classifications. For which active ingredients in pesticides or for which group of pesticides have human case-fatality-ratios been published? What are the geographical distribution and the variability of the reported case-fatality ratios? What is the relationship between the human case-fatality and WHO hazard classes? Which factors influence the case-fatality? Which severity scores are used with respect to pesticide poisonings? Given the research questions our study was rather scoping. Using e.g. case-fatality as toxicity indicator in hazard assessment presumes that data were available for a sufficient number of pesticides and that severity was validly estimated from accessible sources. We therefore depicted heterogeneity across countries, cause of poisonings, and treatment facilities. 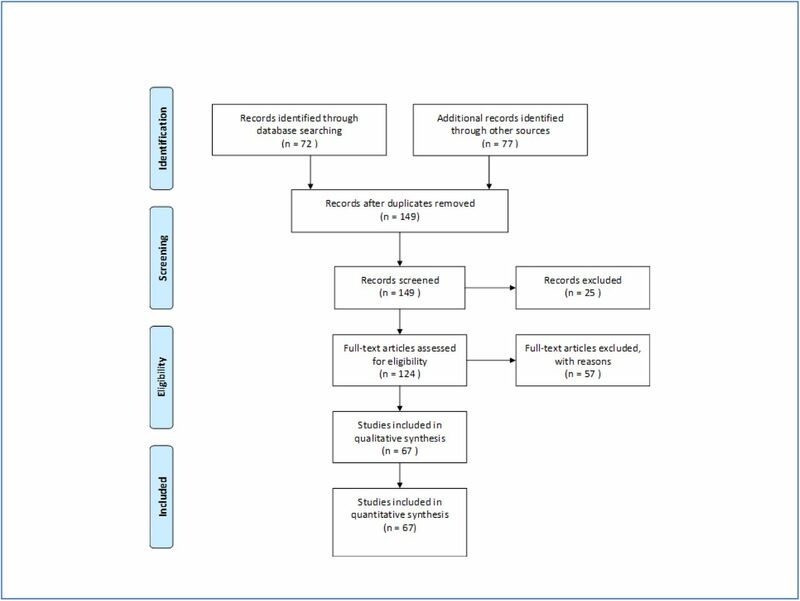 We conducted a systematic literature review without prior protocol by starting the search for publications in the database PUBMED. We used the terms “pesticides” AND (“case-fatality-ratio” OR “case-fatality-rate” OR “poisoning severity score”) and allowed for studies in English, German, Portuguese and Spanish language with publication date between January 1990 and October 2014. The search procedure was repeated with the database SCOPUS which has a higher coverage outside medical sciences and also includes the database EMBASE completely as of 1996. In a sensitivity analysis, addressing our search strategy and a possibly too strict selection, we additionally searched for specific pesticides and checked these with the results in our automatic search as outlined below. Following the PRISMA-Statement records were screened and excluded in case abstracts clearly indicated non-eligibility, e.g. when only specific symptoms of poisonings or animals were studied. Full-text-analysis was carried out on all other records. Studies were considered eligible when addressing active ingredients in pesticides or groups of active ingredients (e.g. organophosphates). Case-studies and all papers were excluded which did not report or not allowed to calculate a case fatality. The search was supplemented by inspecting bibliographic reference lists in all identified papers. Articles which were not found by the automatic search in the first place were then manually back searched. Finally, 149 papers were identified of which 67 could be included after assessment. We excluded 25 papers by abstract and 57 by full-text analysis mainly because no information on active ingredients or group of pesticides was presented (figure 1). Fig 1. Flow diagram according to PRISMA-Statement for the selection of studies. Case fatality was extracted from all included publications. In most papers case fatality was referred to as case-fatality-ratio (CFR) or mortality-ratio and was given as number of fatal poisonings divided by the number of all poisonings with a specific agent or group of agents respectively. When the CFR was not stated in the studies we calculated from given numbers of incidents. Case fatality and indicators used as descriptors of the poisoning severity as well as information on the number of patients, the country, year, cause of poisoning, and timespan of the study were retrieved study-wise for each poisoning agent in a data base. Overall, case numbers and case fatality ratios were studied by minimum, mean, median, and maximum values overall and for specific active ingredients or group of pesticides if addressed by more than one paper. The variability of the CFR was assessed by the coefficient of variation (CV) as the ratio of the standard deviation to the mean. Mathematically, a CFR lower or equal 100 % indicates low variability taking the exponential distribution as a reference. Calculation of CV was restricted to those pesticides which were addressed in more than three papers. All calculations were done by SAS 9.2 software. Due to our scoping interest we did not impose any quality constraints on the studies. We furthermore did not weight the extracted data with respect to study characteristics. The search strategy was developed by both authors. Screening of records and data retrieval was mainly done by one author (WB). To assess possible bias from handling of exclusion criteria a random sample of 20 % of all excluded records were additionally cross-checked by the other author (SM). SM furthermore repeated the data extraction of a 20 % sample of all included papers. There was no disagreement between both authors’ decisions. Sixty-seven publications reporting case fatality rates on 68 active ingredients and additionally on 13 groups of active ingredients were identified (table 1). Almost two-third of the active ingredients is covered by just one publication. The most mentioned active ingredient is glyphosate which is addressed in 16 papers followed by paraquat in 14 papers. With respect to groups of pesticides organophosphates are most frequently studied. Study characteristics and case fatality rates for reported groups of pesticides and active ingredients. Thirty-one papers report on studies from 14 different countries. In total, 20 countries are covered by the included studies with Taiwan and Sri Lanka most often addressed (table 2). Mean CFR for the listed groups of pesticides is 12 % (median 9.2 %) with no reported fatalities for coumarins and pyrethrins (tab 1). Highest group related CFR is 38 % for diethyl-organophosphates. With respect to active ingredients the mean CFR is 15 % (median 8.2 %) with highest CFR of 100 % seen for propamocarb followed by parathion methyl with 60 %. Of active ingredients considered, 18 % show case-fatality above 20 %, this applies to 17 % of the groups of pesticides. In order to study how the CFR is captured by well-known hazard classification schemes table 3 presents grouped CFR by classes of the WHO Recommended Classification of Pesticides by Hazard. Of those 12 active ingredients with a CFR above 20 % two (parathion ethyl and parathion methyl) are WHO-classified as extremely hazardous (Ia) and two (dichlorvos, monocrotophos) as highly hazardous (Ib). A CFR above 10 % was observed in 38 % of pesticides which are WHO-classified as Ia or Ib. Furthermore, two of seven pesticides considered “unlikely to present hazard in normal use” show CFR above 20 % (picloram, propamocarb). However, propamocarb fatality was reported in one study only with a single patient . Figure 2 displays CFR for active ingredients and their hazard classes. Fig 2. Median case-fatality-rates for active ingredients of pesticides and WHO hazard classes. E =extremely hazardous, Highly hazardous, M=moderately hazardous, S=slightly hazardous, U=unlikely to present acute hazard. Some pesticides with high human case-fatality are inappropriately classified. Agents stated “obsolete” or “not listed” not shown. Thirty pesticide groups or active ingredients were studied by more than one paper and nine by more than three papers. Table 4 gives the coefficients of variation (CV) along with case-fatalities and WHO-classification on all pesticides addressed in more than three publications. All CFR show a coefficient of variation lower or equal 100 %. Four out of the seven active ingredients are seen with a CV even well below 100 % whereas only malathion and glyphosate reach 93 % and 100 % respectively. Glyphosate serves as an example of how structural aspects may increase variability of CFR. The highest value of 29 % was seen in a study in Taiwan recruiting in two hospitals which serve as referral hospitals and include a poisoning control center. The lowest value of 0.06 % follows from two deaths in 3.464 human exposure cases (98 % unintentional) collected in the US National Poison Data System by telephone calls received in 57 regional poison centers . If only those cases treated in health care facilities were taken as the denominator (see Mowry et al. p 1165), the CFR would be 3.6 % and further decrease the variability across countries. The variability of CFR might depend on the cause of poisonings. Most pesticide poisonings reported in the included papers follow from suicidal intention. Therefore a direct comparison of accidental and suicidal causes is possible only for organophosphates with two papers on accidental poisoning [30,31] five on suicidal poisoning [11,19,21,41,72], and two on both [18,65]. When intoxication was suicidal, mean CFR was 14 % compared to 6 % for unintentional occasions. Clinical indicators for the severity of poisonings were mentioned in many papers. Although the Poisoning Severity Score (PSS) was part of the search terms we found more papers reporting on the Glasgow Coma Score (GCS). Additionally the Acute Physiology and Chronic Health Evaluation Score (APACHE), the Sequential Organ Failure Assessment (SOFA), and the Simplified Acute Physiology Score (SAPS) were used along with scores built specifically by the study authors (table 5). Studies often aim at a comparison of different indicators with respect to their performance for predicting study specific clinical outcomes. More information on the used indicators is available in some studies, e.g. mean and grading of scores. However, the number of papers in this review is too limited to study the variability of indicators with respect to specific group of pesticides or active ingredients. Case fatality of poisoning is considered as basically dependent on intention, dose, time between exposition and treatment, and access to treatment. Therefore the CFR it is not expected to indicate toxicity of an agent but of the specific poisoning case. In contrast, our results show that variability across countries and studies is rather low even when group of pesticides with different chemical compounds are considered. This is in agreement with Hrabetz et al. who concluded that the CFR in a German cohort of organophosphate intoxicated patients were similar compared to respective rates in developing countries. In contrast, Eddleston et al. suggest that CFR for self-poisoning – including pesticides - in rural Sri Lanka may be ten-fold higher than that of England. However, this comparison was not pesticide specific and therefore does not account for different substance usage. The cause of poisoning seems to influence the CFR. We calculated a mean CFR for organophosphate poisoning more than twice as high for suicidal intoxication compared to unintentional incidents. This relation has also been analyzed in other studies. Recena and colleagues  report for the region of Mato Grosso, Brazil, a CFR of 27.5 % in suicidal poisoning compared to 13 % for all pesticide poisonings. An even higher relation of 9.1 % to 3 % was seen Brazil wide. With respect to single active ingredients a high relation was found especially for some insecticides. Chen et al. calculated an odds ratio of 2.3 for severe poisoning by suicidal versus unintentional cause controlling for several factors in multiple regression. Taken together, the observed low trans-country variability of CFR seen in this review might reflect that most of the reported pesticides poisonings result from intentional ingestion. With respect to the WHO Recommended Classification of Pesticides by Hazard our review shows less agreement between WHO classes and CFR than expected. Only about one third of the pesticides with highest CFR (>20%) are marked by the highest WHO class (Ia,Ib) and about one fifth are even considered as unlikely to present acute hazard. This disagreement confirms what previously has been reported by single studies [10,11,12]. Unfortunately, the number of pesticides addressed by several studies is too small in our review to allow for an in-depth analysis of variability of CFR with respect e.g. to WHO hazard classes or the number of cases. Furthermore, we are not aware of publications comparing human CFRs of pesticide poisoning with toxicity outcomes of animal experiments. However, case-study based human lethal doses of substances have been studied for interspecies comparisons. Ekwall et al. compiled lethal doses from medical handbooks for 50 selected chemicals including five pesticides. Mean lethal doses stretch from 2.5 grams for paraquat to 52 grams for malathion with little variation within the active ingredients. Low variability of CFR would correspond to low variability of lethal doses. Our review has some limitations. The reliability of CRF may be limited by selection bias, say that primarily severe poisonings were subject to treatment and therefore a higher case fatality is observed in studies. We tried to avoid this possible bias by excluding pure case studies from this review. All CFRs presented are based on a longitudinal study design (retro- or prospective). In most studies, all patients with poisonings in a given time period admitted to the hospitals were included by study design so that CFR is indicative for all poisonings treated. However, it can still be the case that a hospital or center is specialized to the treatment of poisonings and therefore primarily severe cases will be admitted here. Eddleston et al. analyzed the influence of patient transfers between hospitals and found that 50 % of self-poisonings admitted to small rural hospitals in Sri Lanka were treated there and discharged home. So, CFR in secondary referral hospitals were high because of selection bias. However, their observed CFR of 7.4 % in rural and 11 % in secondary hospitals show no substantial difference. There is also concern for underestimation of CFR as it can be assumed that hospitals prepared and interested in conducting and publishing scientific studies have probably much higher standards in treatment facilities and staff. Dharmani and Jaga  reviewed the literature on organophosphate poisoning und summarized that in rural areas of developing countries access to immediate treatment is often limited. Furthermore rural hospitals suffer from poor equipment (e.g. missing ventilation). A further reason for underestimation of CFR may be that patients die before admission to medical services and therefore stay unconsidered in CFR figures of hospitals statistics [16,50]. Time to admission does not seem to play a clear-cut role for pesticide poisonings. No significant difference between survivors and non-survivors with respect to time from ingestion was seen in several studies [10,27,35,50]. In contrast, Vucinic et al. found late admission >4 h to hospital a risk factor for mortality of carbamate poisoning. Chen et al. showed increasing percentage of severe/fatal glyphosate poisoning with increasing time lag until admission even after adjustment in multivariate analysis. However, for glyphosate it was reported that non-survivors were hospitalized significantly faster than survivors , the same was also observed for paraquat . Therefore, the influence of time to admission on CFR may be not only specific for active ingredients, but also arise from selection bias as patients may die before reaching hospitals . Finally, the search strategy was selective as the search term “pesticides” was used. This is a trade-off between a high number of false positives references when merely “poisonings” were addressed and the high number of singles active ingredients in pesticides which could be included in the search. 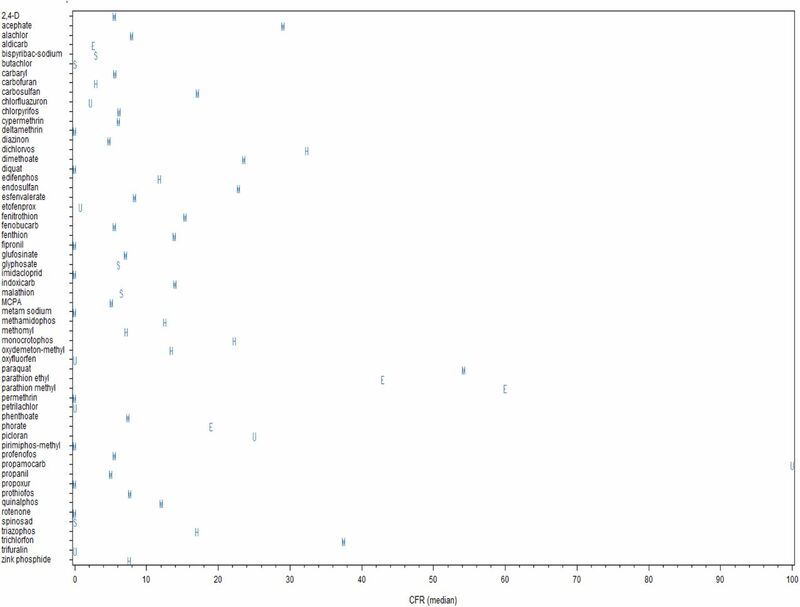 In order to rate a possibly too rigid selection, we conducted an additional search as a sensitivity analysis. We selected all pesticides of the PAN (Pesticide Action Network)-International list of highly hazardous pesticides  which are denoted by three or more items of concern. Ten out of these 15 active ingredients were so far not addressed by the studies included in this review (azinphos-methyl, captafol, chlordane, DDT, hexachlorobenzene, lambda-cyhalothrin, omethoate, parathion, PCP (pentachlorphenol), phosphamidon). In November 2015, each of these pesticides was searched in combination with “case-fatality *” in the data bases Pubmed, Embase and Scopus with no language restraints. As a result 16 studies could be identified which were not found by our original search strategy for the above mentioned period. However, none of these studies were eligible given our outlined criteria. Reasons were e.g. different scope of studies (e.g. Malaria and DDT) or patchy acronyms (e.g. PCP short for “pentachlorphenol” as well as “pneumocystis pneumonia”). Additionally, two papers were identified which were published after our inclusion date October 2014. Both were also not eligible for our review. Summing up, the apparently good coverage of our search strategy is probably due to the rather extensive back search which identified more records than the automatic search. Still, we assume that a great number of eligible studies remain undetected because active ingredients of pesticides are not mentioned as keywords or in the title. Additionally, pesticides are not a well-defined group of chemicals and names often vary. However, we do not imagine reasons for a systematic bias in reported CFR due to studies which slipped our search. In fact, after finishing this review we have been made aware of additional studies giving CFR well within the range of table 1 [83-85]. However, for aluminium phosphide a CFR of 77 % was reported  higher than that in table 1 (max=67 %). In a review on diquat poisoning Jones & Vale reported 30 cases in the timespan 1968-1999 with a CFR of 43 % . This contrasts to table 1 results of no fatalities reported for 56 cases treated in US health centers in 1992 . A fatal poisoning by fipronil is stated by  as a historic case with no details on the inclusion criteria. Only a small number of active ingredients in pesticides were addressed by several studies. So our analysis could not be extended to possible constituents of case-fatality like dose, populations, chemical formulations of the pesticides, or treatment regimes. Furthermore, we refrained from imposing quality scores to the study results prior analysis. This might be possibly after a more comprehensive survey and documentation of poisoning is achieved. However, if human case-fatality was to be used as an indicator of the toxicity of substances in hazard classification then non-stratified rates would be needed because rather general assessments were intended. We studied the availability and variability of case-fatality ratios due to pesticide poisonings. Given the large number of world-wide pesticide poisonings we found an unexpected small number of 67 publications on 68 active ingredients covering 20 countries. Besides missed publications this is probably best explained by insufficient resources of primary care hospitals to systematically analyze and report poisoning cases. Furthermore, it is well known that poison control centers in many countries do not provide public reporting at all or report on an aggregated level only. This review confirms the limited agreement between the case-fatality-ratio of human acute pesticides poisoning and the WHO hazard classification of the respective pesticide. The hazard and risk assessment of the acute toxicity of pesticides should not be based on data from animal tests only, but should also consider available information on human intoxications. The active ingredient specific case-fatality-rate of acute human pesticide poisoning showed little variability in this systematic review. The case-fatality therefore seems to indicate not only the severity of an individual poisoning incident but also an intrinsic property of the pesticide. So, the case-fatality might well capture the human acute toxicity of an active ingredient and could be utilized for prioritization of highly hazardous pesticides. By simply improving the reporting of available poisoning data valuable indicators could be gained for hazard and risk management of pesticides. Pesticide poisonings are addressed in the International Classification of Diseases (ICD). However, the current version does not reflect the changed pesticide market and the public health importance of certain pesticide classes and active ingredients. The ongoing 11th revision of ICD should be aimed to a more appropriate coding system of poisonings. As a policy implication human case-fatality data should be retrieved along with the animal-test based hazard classes as part of the regular process of the registration and regulation of pesticides. We gratefully acknowledge helpful comments and support by Carina Weber and Lars Neumeister who brought the topic to our attention and additionally provided relevant publications. For assistance with the literature search and data retrieval we especially thank Lukas Zimmermann. Rao CS, Venkateswarlu V, Surender T, Eddleston M, Buckley NA. Pesticide poisoning in south India: opportunities for prevention and improved medical management. Tropical Medicine & International Health. 2005; 10(6): 581–8. Dawson AH, Eddleston M, Senarathna L, Mohamed F, Gawarammana I, Bowe SJ, Manuweera G, Buckley NA. Acute Human Lethal Toxicity of Agricultural Pesticides: A Prospective Cohort Study. Plos Medicine. 2010; 7(10): e1000357. van der Hoek W, Konradsen F. Analysis of 8000 hospital admissions for acute poisoning in a rural area of Sri Lanka. Clinical Toxicology. 2006; 44(3): 225–31. Persson HE, Sjoberg GK, Haines JA, Pronczuk dG. Poisoning severity score. Grading of acute poisoning. J Toxicol Clin Toxicol. 1998; 36: 205–13. Eddleston M, Eyer P, Worek F, Mohamed F, Senarathna L, von Meyer L, Juszczak E, Hittarage A, Azhar S, Dissanayake W, Sheriff MHR, Szinicz L, Dawson AH, Buckley NA. Differences between organophosphorus insecticides in human self-poisoning: a prospective cohort study. Lancet. 2005;366(9495):1452–9. Eddleston M, Sudarshan K, Senthilkumaran M, Reginald K, Karalliedde L, Senarathna L, de Silva D, Sheriff MHR, Buckley NA, Gunnell D. Patterns of hospital transfer for self-poisoned patients in rural Sri Lanka: implications for estimating the incidence of self-poisoning in the developing world. Bulletin of the World Health Organization. 2006; 84(4): 276–82. Eddleston M, Eyer P, Worek F, Sheriff MHR, Buckley NA. Predicting outcome using butyrylcholinesterase activity in organophosphorus pesticide self-poisoning. Q J M-An International Journal of Medicine. 2008; 101(6): 467–74. Emerson GM, Gray MN, Jelinek GA, Mountain D, Mead HJ. Organophosphate poisoning in Perth, Western Australia, 1987-1996. Journal of Emergency Medicine. 1999; 17(2): 273–7. Goel A, Joseph S, Dutta TK. Organophosphate poisoning: predicting the need for ventilatory support. J Assoc Physicians India. 1998; 46(9): 786–90. Grmec S, Mally S, Klemen P. Glasgow coma scale score and QTc interval in the prognosis of organophosphate poisoning. Academic Emergency Medicine. 2004; 11(9): 925–30. Hrabetz H, Thiermann H, Felgenhauer N, Zilker T, Haller B, Nahrig J, Saugel B, Eyer F. Organophosphate poisoning in the developed world - A single centre experience from here to the millennium. Chemico-Biological Interactions. 2013; 206(3): 561–8. Huang NC, Lin SL, Hung YM, Hung SY, Chung HM. Severity assessment in acute paraquat poisoning by analysis of APACHE II score. Journal of the Formosan Medical Association. 2003; 102(11): 782–7. Ikebuchi J, Proudfoot AT, Matsubara K, Hampson ECGM, Tomita M, Suzuki K, Fuke C, Ijiri I, Tsunerari T, Yuasa I, Okada K. Toxicological Index of Paraquat - A New Strategy for Assessment of Severity of Paraquat Poisoning in 128 Patients. Forensic Science International. 1993; 59(2): 85–7. Kumar, SV, Venkateswarlu, V, Sasikala, M, Kumar, GV. A study on poisoning cases in a tertiary care hospital. Journal of Natural Science, Biology and Medicine. 2010; 1(1): 35–39. Lauterbach M, Solak E, Kaes J, Wiechelt J, Von Mach MA, Weilemann LS. Epidemiology of hydrogen phosphide exposures in humans reported to the poison center in Mainz, Germany, 1983-2003. Clinical Toxicology. 2005; 43(6): 575–81. Lee CH, Shih CP, Hsu KH, Hung DZ, Lin CC. The early prognostic factors of glyphosate-surfactant intoxication. American Journal of Emergency Medicine. 2008; 26(3): 275–81. Lee HL, Chen KW, Chi CH, Huang JJ, Tsai LM. Clinical presentations and prognostic factors of a glyphosate-surfactant herbicide intoxication: A review of 131 cases. Academic Emergency Medicine. 2000; 7(8): 906–10. Lee P, Tai DYH. Clinical features of patients with acute organophosphate poisoning requiring intensive care. Intensive Care Medicine. 2001; 27(4): 694–9. Lee Y, Lee JH, Seong AJ, Hong CK, Lee HJ, Shin DH, Hwang SY. Arterial lactate as a predictor of mortality in emergency department patients with paraquat intoxication. Clinical Toxicology. 2012; 50(1): 52–6. Levy-Khademi F, Tenenbaum AN, Wexler ID, Amitai Y. Unintentional organophosphate intoxication in children. Pediatric Emergency Care. 2007; 23(10): 716–8. Lifshitz M, Shahak E, Bolotin A, Sofer S. Carbamate poisoning in early childhood and in adults. Journal of Toxicology-Clinical Toxicology. 1997; 35(1): 25–7. Lifshitz M, Shahak E, Sofer S. Carbamate and organophosphate poisoning in young children. Pediatric Emergency Care. 1999; 15(2): 102–3. Lima JS, Reis CAG. Poisoning Due to Illegal Use of Carbamates As A Rodenticide in Rio-De-Janeiro. Journal of Toxicology-Clinical Toxicology. 1995; 33(6): 687–90. Lo YC, Yang CC, Deng JF. Acute alachlor and butachlor herbicide poisoning. Clinical Toxicology. 2008; 46(8): 716–21. Min YG, Ahn JH, Chan YC, Ng SH, Tse ML, Lau FL, Chan CK. Prediction of prognosis in acute paraquat poisoning using severity scoring system in emergency department. Clinical Toxicology. 2011; 49(9): 840–5. Mowry JB, Spyker DA, Cantilena LR, Bailey JE, Ford M. ABSTRACTS 2012 Annual Report of the American Association of Poison Control Centers’ National Poison Data System (NPDS): 30th Annual Report Abstracts. Clinical Toxicology. 2013; 51(10): 949–1229. Murali R, Bhalla A, Singh D, Singh S. Acute pesticide poisoning: 15 years experience of a large North-West Indian hospital. Clinical Toxicology. 2009; 47(1): 35–8. Nagami H, Nishigaki Y, Matsushima S, Matsushita T, Asanuma S, Yajima N, Usuda M, Hirosawa M. Hospital-based survey of pesticide poisoning in Japan, 1998-2002. International Journal of Occupational and Environmental Health. 2005; 11(2): 180–4. Nelson LS, Perrone J, DeRoos F, Stork C, Hoffman RS. Aldicarb poisoning bay an illicit rodenticide imported into the United States: Tres Pasitos. Journal of Toxicology-Clinical Toxicology. 2001; 39(5): 447–52. Nisse P, Deveaux M, Tellart AS, Dherbecourt V, Peucelle D, Mathieu-Nolf M. Aldicarb poisoning: review of the intoxication cases in north of France 1998-2001. Acta Clinica Belgica. 2002;Supp 2002-112-5. Peter JV, Thomas L, Graham PL, Moran JL, Abhilash KPP, Jasmine S, Iyyadurai R. Performance of clinical scoring systems in acute organophosphate poisoning. Clinical Toxicology. 2013; 51(9): 850–4. Recena MCP, Pires DX, Caldas ED. Acute poisoning with pesticides in the state of Mato Grosso do Sul, Brazil. Science of the Total Environment. 2006;357(1-3):88–95. Roberts DM, Buckley NA, Mohamed F, Eddleston M, Goldstein DA, Mehrsheikh A, Bleeke MS, Dawson AH. A prospective observational study of the clinical toxicology of glyphosate-containing herbicides in adults with acute self-poisoning. Clinical Toxicology. 2010;48(2):129–36. Saadeh AM, Alali MK, Farsakh NA, Ghani MA. Clinical and sociodemographic features of acute carbamate and organophosphate poisoning: A study of 70 adult patients in North Jordan. Journal of Toxicology-Clinical Toxicology. 1996; 34(1): 45–51. Senanayake N, Desilva HJ, Karalliedde L. A Scale to Assess Severity in Organophosphorus Intoxication - POP Scale. Human & Experimental Toxicology. 1993; 12(4): 297–9. Seok SJ, Park JS, Hong JR, Gil HW, Yang JO, Lee EY, Song HY, Hong SY. Surfactant volume is an essential element in human toxicity in acute glyphosate herbicide intoxication. Clinical Toxicology. 2011; 49(10): 892–9. Seok SJ, Choi SC, Gil HW, Yang JO, Lee EY, Song HY, Hong SY. Acute Oral Poisoning Due to Chloracetanilide Herbicides. Journal of Korean Medical Science. 2012; 27(2): 111–4. Shadnia S, Darabi D, Pajoumand A, Salimi A, Abdollahi M. A simplified acute physiology score in the prediction of acute organophosphate poisoning outcome in an intensive care unit. Human & Experimental Toxicology. 2007; 26(8): 623–7. Shadnia S, Sasanian G, Allami P, Hosseini A, Ranjbar A, Amini-Shirazi N, Abdollahi M. A retrospective 7-years study of aluminum phosphide poisoning in Tehran: opportunities for prevention. Human & Experimental Toxicology. 2009; 28(4): 209–13. Shadnia, S, Mehrpour, O, Soltaninejad, K. A simplified acute physiology score in the prediction of acute aluminum phosphide poisoning. Indian J Med Sci. 2010; 64(12): 532–539. Suh JH, Oh BJ, Roh HK. Clinical outcomes after suicidal ingestion of glyphosate surfactant herbicide: severity of intoxication according to amount ingested. Clininal Toxicology. 2007; 45641. Sungur M, Guven M. Intensive care management of organophosphate insecticide poisoning. Critical Care. 2001; 5(4): 211–5. Sungurtekin H, Gurses E, Balci C. Evaluation of several clinical scoring tools in organophosphate poisoned patients. Clinical Toxicology. 2006; 44(2): 121–6. Tagwireyi D, Ball DE, Nhachi CFB. Toxicoepidemiology in Zimbabwe: Pesticide poisoning admissions to major hospitals. Clinical Toxicology. 2006; 44(1): 59–66. Talbot AR, Shiaw MH, Huang JS, Yang SF, Goo TS, Wang SH, Chen CL, Sanford TR. Acute-Poisoning with A Glyphosate-Surfactant Herbicide (Round-Up) - A Review of 93 Cases. Human & Experimental Toxicology. 1991; 10(1): 1–8. Tominack RL, Yang GY, Tsai WJ, Chung HM, Deng JF. Taiwan-National-Poison-Center Survey of Glyphosate Surfactant Herbicide Ingestions. Journal of Toxicology-Clinical Toxicology. 1991; 29(1): 91–109. Tsao TCY, Juang YC, Lan RS, Shieh WB, Lee CH. Respiratory-Failure of Acute Organophosphate and Carbamate Poisoning. Chest. 1990; 98(3): 631–6. Verhulst L, Waggie Z, Hatherill M, Reynolds L, Argent A. Presentation and outcome of severe anticholinesterase insecticide poisoning. Archives of Disease in Childhood. 2002; 86(5): 352–5. Vucinic S, Jovanovic D, Antonijevic B, Vucinic Z, Djordjevic D, Potrebic O, Rezic T. Acute carbamate poisoning treated in the National Poison Control Centre during ten years period. Clinical Toxicology. 2009; 47(5): 506–7. Weissmann-Brenner A, David A, Vidan A, Hourvitz A. Organophosphate poisoning: A multihospital survey. Israel Medical Association Journal. 2002; 4(7): 573–6. Weng CH, Hu CC, Lin JL, Lin-Tan DT, Huang WH, Hsu CW, Yen TH. Sequential Organ Failure Assessment Score Can Predict Mortality in Patients with Paraquat Intoxication. Plos One. 2012; 7(12): e51743. Xia CY, Wang M, Liang Q, Yun LA, Kang HS, Fan L, Wang DS, Zhang GY. Changes in monoclonal HLA-DR antigen expression in acute organophosphorus pesticide-poisoned patients. Experimental and Therapeutic Medicine. 2014; 7(1): 137–40. Yamashita M, Yamashita M, Tanaka J, Ando Y. Human mortality in organophosphate poisonings. Veterinary and Human Toxicology. 1997; 39(2): 84–5. Yang CC, Wu JF, Ong HC, Hung SC, Kuo YP, Sa CH, Chen SS, Deng JF. Taiwan National Poison Center: Epidemiologic data 1985-1993. Journal of Toxicology-Clinical Toxicology. 1996; 34(6): 651–63. Zaheer, MS, Aslam, M, Gupta, V, Sharma, V, Khan, SA. Profile of poisoning cases at A North Indian tertiary care hospital. Health and Population: Perspectives and Issues. 2009;32(4):176–183. Agarwal SB. A Clinical, Biochemical, Neurobehavioral, and Sociopsychological Study of 190 Patients Admitted to Hospital As A Result of Acute Organophosphorus Poisoning. Environmental Research. 1993; 62(1): 63–70. Akdur O, Durukan P, Ozkan S, Avsarogullari L, Vardar A, Kavalci C, Ikizceli I. Poisoning severity score, Glasgow coma scale, corrected QT interval in acute organophosphate poisoning. Human & Experimental Toxicology. 2010; 29(5): 419–25. Bilgin TE, Camdeviren H, Yapici D, Doruk N, Altunkan AA, Altunkan Z, Oral U. The comparison of the efficacy of scoring systems in organophosphate poisoning. Toxicology and Industrial Health. 2005;21(7-8):141–6. Caldas ED, Rebelo FM, Heliodoro VO, Magalhaes AFA, Rebelo RM. Poisonings with pesticides in the Federal District of Brazil. Clinical Toxicology. 2008; 46(10): 1058–63. Carroll R, Metcalfe C, Gunnell D, Mohamed F, Eddleston M. Diurnal variation in probability of death following self-poisoning in Sri Lanka-evidence for chronotoxicity in humans. International Journal of Epidemiology. 2012; 41(6): 1821–8. Chaou CH, Lin CC, Chen HY, Lee CH, Chen THH. Chlorpyrifos is associated with slower serum cholinesterase recovery in acute organophosphate-poisoned patients. Clinical Toxicology. 2013; 51(5): 402–8. Chen, H-H, Lin, J-L, Huang, W-H, Weng, C-H, Lee, S-Y, Hsu, C-W, Chen, K-H, Wang, I-K, Liang, CC, Chang, C-T, T.-H. Yen. Spectrum of corrosive esophageal injury after intentional paraquat or glyphosate-surfactant herbicide ingestion. International Journal of General Medicine. 13-8-2013;6677–683. Chen YJ, Wu ML, Deng JF, Yang CC. The epidemiology of glyphosate-surfactant herbicide poisoning in Taiwan, 1986-2007: a poison center study. Clinical Toxicology. 2009; 47(7): 670–7. Churi S, Bhakta K, Madhan R. Organophosphate Poisoning: Prediction of Severity and Outcome by Glasgow Coma Scale, Poisoning Severity Score, Acute Physiology and Chronic Health Evaluation Ii Score, and Simplified Acute Physiology Score Ii. Journal of Emergency Nursing. 2012; 38(5): 493–5. Davies JOJ, Eddleston M, Buckley NA. Predicting outcome in acute organophosphorus poisoning with a poison severity score or the Glasgow coma scale. Qjm-An International Journal of Medicine. 2008; 101(5): 371–9. Deguigne MB, Lagarce L, Boels D, Harry P. Metam sodium intoxication: the specific role of degradation products – methyl isothiocyanate and carbon disulphide - as a function of exposure. Clinical Toxicology. 2011; 49(5): 416–22. Dippenaar R, Diedericks RJ. Paediatric organophosphate poisoning – a rural hospital experience. Samj South African Medical Journal. 2005; 95(9): 678–81. Eddleston M, Rajapakshe M, Roberts D, Reginald K, Sheriff MHR, Dissanayake W, Buckley N. Severe Propanil [N-(3,4-dichlorophenyl) propanamide] pesticide self-poisoning. Journal of Toxicology-Clinical Toxicology. 2002; 40(7): 847–54.